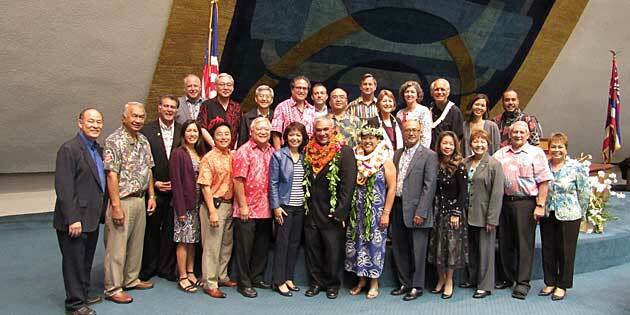 On Friday, March 6th the State Senate unanimously confirmed Jobie M. K. Masagatani as Chair of the Hawaiian Homes Commission and Director of the Department of Hawaiian Home Lands. Chair Masagatani continues her leadership of the Department of Hawaiian Homes Lands from her appointment two years ago under former Gov. Neil Abercrombie. Gov. David Ige and Lt. Gov. Shan Tsutsui were in attendance to lend their support for Chair Masagatani. Sen. Maile Shimabukuro (D-Waianae), in her statements on the Senate floor, recognized the outpouring of support from department staff and community leaders in favor of Masagatani’s confirmation and cited her academic and professional credentials that made Masagatani the right person for the position. Joining Chair Masagatani at the leadership helm of the department is William J. Ailā, Jr. as Deputy to the Chair. Deputy Ailā was also unanimously confirmed on Friday to his position with the Hawaiian Homes Commission, having recently served under the Abercrombie administration as Director of the Department of Land and Natural Resources. In his statements from the Senate floor, Sen. Brickwood Galuteria (D) recognized Ailā’s life-long commitment to native land and cultural practitioner’s rights which stemmed from his involvement in dealings with the U.S. Military in Mākua Valley. Sen. Galuteria also recognized the date as Deputy Ailā’s birthday.